As part of a University of Georgia and Georgia Department of Natural Resources cooperative research project, rabbit season on Di-Lane WMA will be different than in past years. Rabbit hunting will take place on designated areas of the property and on certain days of the week. The map (seen below) indicates which areas of the property may be hunted on what days. Areas will be marked with color-coded signs on the property, and rabbit hunters are to sign in at the check station prior to hunting. An additional map with directions, as well as brochures will be available at the check station. 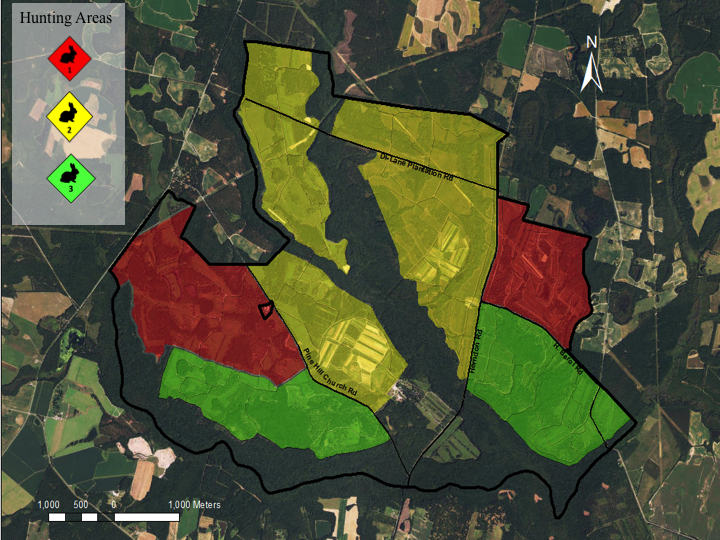 These changes are being made due to ongoing research with Warnell School of Forestry and Natural Resources at The University of Georgia, which is investigating the relationship between rabbit hunting and Northern Bobwhite populations on the property. We want to thank you all for your cooperation and understanding, as you all help make our research possible!